A library is a project whose functions can be reused in other scripts. To learn how to properly create, include, and use a library, see the sections below. Warning: A script that uses a library does not run as quickly as it would if all the code were contained within a single script project. Although libraries can make development and maintenance more convenient, you should use them sparingly in projects where speed is critical. Because of this issue, library use should be limited in add-ons. To include a library in your project you must have at least a read-level access to it. If you are not the author of the library that you want to include, you need to contact the author and request them to grant you access. 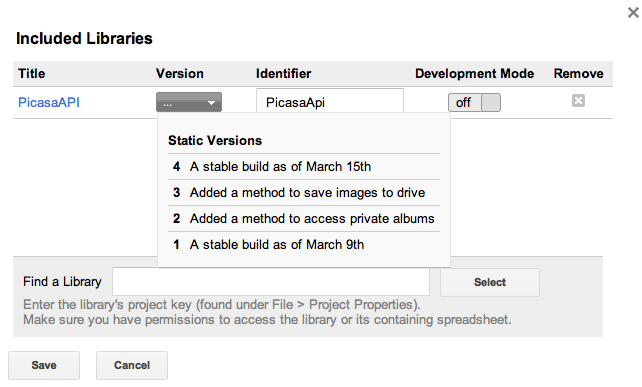 You also need the project key of the library you are including. 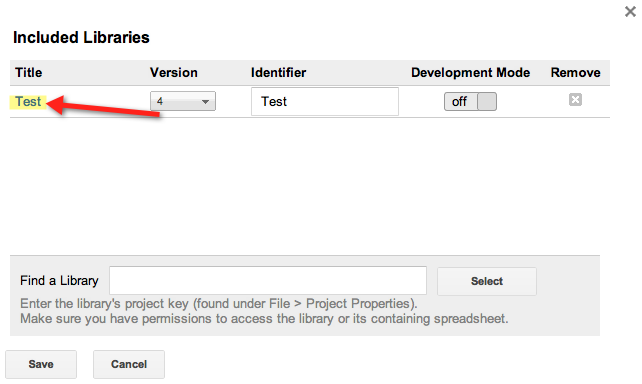 If you have access to the library, you can find the project key under File > Project Properties... Otherwise, you need to ask the author of the library to give you the project key. Paste in the project key of the library that you want to use into the Add a Library text box. Click Add to add the library to your project. If you encounter an authorization error, make sure that you have at least read-level access to the project that you are trying to include. Click on the Version dropdown and select a version of this library that you want to use. Check to see if the default Identifier name is the one that you would like to use with this library. This is the name that your script uses to refer to the library. For example, if you set it to Test then you could call a method of that library as follows: Test.libraryMethod(). If you use an identifier name that matches the name of an already existing service, such as MailApp, or a previously added library, then the library you have added most recently overrides the existing service/library. Enable Development mode if you want to override the selected version. For more information, see Testing and debugging a library. Click Save to save the libraries you have added and close the dialog box. You can use your included library just as you would use a default service. For instance, if you have chosen Test as an identifier for your library, just type Test immediately followed by a period to see autocomplete information listing the methods of the library. The name of the library that you have included is a link that opens a new browser tab which contains the reference documentation for this library. Click on the X button to the right of the library to delete it. If the library is deleted by the author you still need to remove it from your list of included libraries. To create a library that you or other developers can include in other scripts, you must first save a version of the library project. You must have at least one saved version of your script. Grant at least read-level access to all potential users of the library. You should choose a meaningful name for your project since it is used as the default identifier when your library is included by others. If you want one or more methods of your script to not be visible (nor usable) to your library users, you can end the name of the method with an underscore. For example, myPrivateMethod_(). Only enumerable global properties are visible to library users. This includes function declarations, variables created outside a function with var, and properties explicitly set on the global object. For example, Object.defineProperty() with enumerable set to false creates a symbol you can use in your library, but this symbol isn't accessible by your users. * Raises a number to the given power, and returns the result. Only the @param and @return annotations are currently supported. Lock The same instance is visible to all including scripts when created in the library. 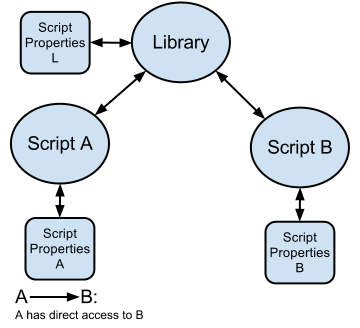 Script Properties The same instance is visible to all including scripts when created in the library. Cache The same instance is visible to all including scripts when created in the library. Triggers Simple triggers created in library are not triggered by the including script. Sites, Spreadsheets and other containers A call to getActive() returns the container of the including script. * This means that the library does not have its own instance of the feature/resource and instead is using the one created by the script that invoked it. 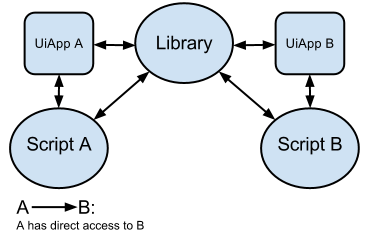 ** This means that library has its own instance of the resource/feature and that all scripts that use the library share and have access to that same instance. When you are using a debugger within a project that has a library included you are able to step into a function of the included library. The code shows up in the debugger in the read-only mode and at the right version. Anyone who has editor-level access to the script has the latest changes made to the files in the library project even if it was not saved as a version. The autocomplete is still generated based on the selected version. Anyone with only the read-level access to the script still uses the selected version regardless of whether the development mode is on or off. You still need at least one version of the library saved.